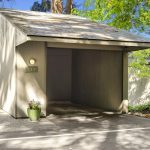 Although you can’t stretch your garage to fit an additional car, many buyers look for space to store somewhat smaller vehicles, such as bicycles or kayaks. Most garages have enough space to store a few bicycles by hanging them from a ceiling or wall. Most any shop that sells bikes also sells hardware to hang them, and it is fairly easy to install—just make sure it’s toward the back, so it doesn’t interfere with the garage door. If you have a detached garage with a higher ceiling (or “rafters”), you can use a similar approach to create storage for larger or longer items like kayaks. Because these items are bigger and heavier, you might consider a simple pulley system to make it easy to lift them to their elevated storage spaces. Particularly important if you’re planning to sell during warmer months, central air conditioning is an item on many buyers’ lists. While the Seattle area only experiences a handful of extremely hot days each year, buyers moving from out of the area are likely used to air conditioning and many might not consider buying a house without it (or asking the seller to pay to have it installed). This one is tricky, because it’s often hard not to recommend installing central air in most homes that already have forced air heating. If you choose not to invest in this particular upgrade, you may keep the attention of more buyers by installing a single-room unit in the master bedroom/suite (and possibly the living or family room, depending on your home’s floorplan). You may complement this approach by upgrading ceiling lights to fans (with lights) in other bedrooms—easy to do for as little as $50 if you’re a handy DIY’er. 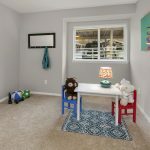 If your home fits a profile that will make it attractive to families with small children, you can bet your prospective buyers will have play space on their lists! Kids love to have spaces of their own (which, in turn, give parents the chance to enjoy their own spaces). A simple solution for this can be accomplished in the process of home staging, by strategically placing children’s items in an office space (if you have one) to show the versatility of the room. Another approach is to create a covered outdoor play area. The cover extends the summer outdoor play season to include much of the spring and fall seasons as well. Don’t forget to provide adequate lighting in this area, though, as the days are much shorter during the “extended season”. Without major construction, it’s hard to add an extra bedroom to your home. If it already has three or four, buyers might only need a guest room for the occasional visitor and not a full-time bedroom. Again, staging may come to the rescue here. By placing a daybed in an office or bonus room, you can suggest to buyers that these spaces can be used as temporary accommodation for guests. Remember, you cannot (in a legal sense) refer to such as space as a true additional bedroom unless it meets certain requirements, such as an exit window. To further increase the usability of such a space, you could consider semi-built-in wardrobe units (think IKEA) to provide a much-needed closet. If dimensions and ceiling height allow, you can also convert an attic to a “loft” bedroom by adding wardrobe storage and larger windows. 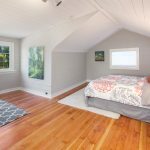 Last year, I helped a client convert an unfinished attic to a legal bedroom by adding a closet, painting, and finishing the floors. You can see photos of this conversion here. If you are blessed with a neighbor whose home or yard ranges from unkempt to trashed, you probably can’t talk them into tidying it up. One obvious solution is to build a fence (which could cost less than you think) to hide or at least distract from the unsightly view. This is a fine (and usually quick) solution. 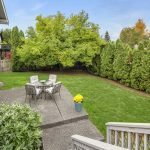 However, if you have a little more time before you’re going to sell your home, a less-expensive and perhaps more attractive solution might be to screen the view with quick-growing plants such as bamboo. Remember, however, that many fast-growing plants have shoots or elaborate root systems that could find their way to places where you don’t want them. You can avoid this (and further enhance the attractiveness of this solution) by planting them in large pots, lined up just where the fence alternative would have gone.